A huge thanks to Play Sport London for sponsoring our 'Special Fun' Project . Club End Of Year Newsletter Available here. The Club has won 'Club of the Year' at Lewisham Sport Awards 2009 - more here. Thanks to all who supported our Mayor's Fund bid - we got the funds! - more here. We raised £75.98 for the Lennox Children's Appeal for a little girl called Scarlett. The Club Annual Display Day was a great success. See photos' and article here. 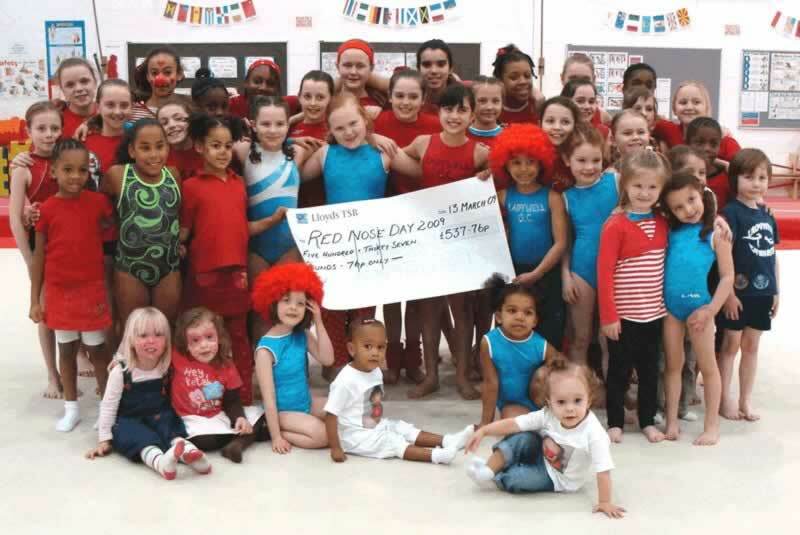 The Club recently held a Fundraising Fun Day. Photos' and article on view here. Club Annual Championships are a resounding success - results & photos' here. Club star Simone Ming retires from Competition - read more here. Club Gymnasts' participate in Spring Regional Championships - read more here. Help the Club raise much needed funds as you shop online- see how easily here. Club Gymnasts' take part in Regional Floor & Vault Competition - see results here. Club Gymnasts' do well at Spring Club & Novice Competition - read results here. Fundraiser Balloon Release final result in! - read more here. Club Gymnasts' win medals at Blue & White Competition - details on line here. From 07th to 14th March, the Club held Red Nose Week in support of Comic Relief. For a donation of £1, children could wear a red garment into the gym during their session. Parents were also encouraged to make a donation and a total of £537.76p was raised. Read more here. On Sunday 22nd February, all the Club staff, including Volunteers, attended a course at the Club to update their awareness, knowledge and qualifications in relation to Child Safety and Awareness. Early in February, Class 3M of John Ball School, Blackheath, London spent two hours at the Club. They sent us some Thank You drawings which you can view here. Latest Club Newsletter Available here. Club Gymnasts and Coaches win Council Awards - details on line here. The Club Annual Awards Evening for achievement in 2008 was held at Catford Powerleague on Saturday 24th January '09. A full list of award recipients is available here. Some photos' are available here.